So as you're reading this I will have just arrived in Mexico for a week of relaxing and drinking cocktails. 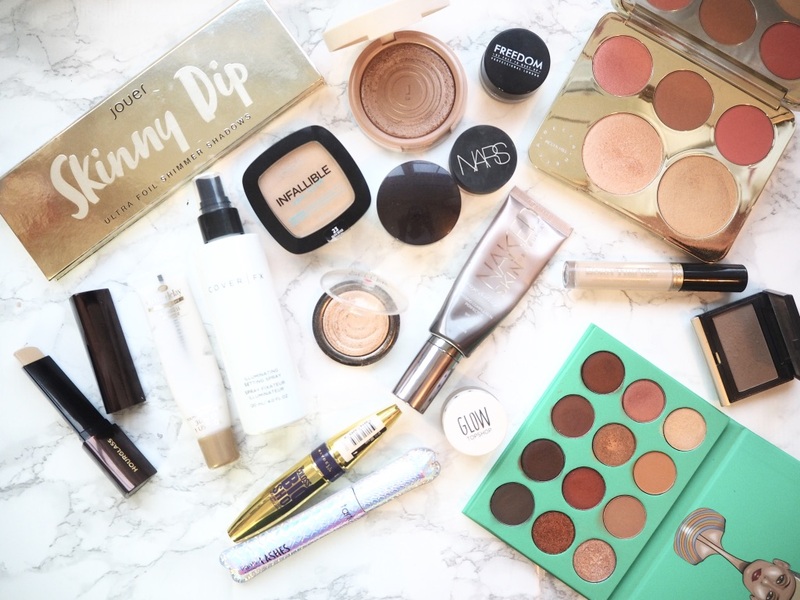 My holiday makeup bag is quite important and always a tough choice about what products to take. Since the weather in Mexicos is going to be very hot my makeup picks will be quite simple and a natural glowing look. Starting with the base and for my primer i'm taking my Boots Time Delay Primer (£10.99) as I love how it smooths out my skin but isn't heavy and creates the perfect canvas for my skin. This is a silky formula that glides onto skin and smoothes out my pores. For my foundation I couldnt just take one so two will be going with me, the Hourglass Vanish Seamless Finish Foundation Stick (£42.00) for something with more coverage but still very natural. This has a natural finish and lightweight but is long wearing and doesn't sweat off in the heat. For a more natural look I am also taking the Urban Decay Naked Skin One & Done (£28.00) with me. This is billed as a hybrid complexion cream that is a mix between a sheer foundation and a tinted moisturiser, I find that this gives me just enough coverage for a natural everyday look. Onto concealer and my favourite Nars Soft Matte Complete Concealer (£24.00) will be taken with me as its pretty much the best concealer ever. Its such a nice formula that is creamy and easy to apply and conceals all dark circles. To also brighten and hydrate my delicate eye area from being in the sun the Too Faced Born This way Concealer (£20.00) will be coming with me. It contains coconut water that hydrates and also smells amazing and the concealer itself gives a natural radiant finish. Setting my under eyes with powder is important and in the heat especially it will be prone to creasing, the Laura Mercier Secret Brightening Powder (£20.00) helps set my concealer down and stop is from smudging but also brightens that area. For the rest of my face the best powder I have found is the L'Oreal Pro Glow Powder ($12.99)* as it has a shimmer running through it so it really helps the skin glow. On holiday bronzer is an important part of the routine and the Topshop Horizon Highlighter (£12.00) is my favourite product to warm up my face and a nice glow. Although its said to be a highlighter its too dark to be one for me so it has become the perfect bronzer. To help contour and define my cheek bones a darker contour shade is needed and the Kevyn Aucoin Sculpting Powder (£35.00) is so pigmented and intense that its really does chisel into my cheek bones. Next is the most important step and even more so on holiday - highlighter. To kill two birds with once stone I'll be taking my Becca x Jaclyn Hill Palette as it contains highlighters and blushers. It has the famous Champagne Pop, which gives a gorgeous peachy glow and Prosecco Pop, which is more of a yellow gold tone. To really make these pop i'll be taking my Topshop Glow Pot in Gleam (£10.00) to wear underneath them as the powder highlight really clings to the cream formula and looks so intense. Finally I will also be taking my Laura Geller Gilded Honey Illuminator (£16.50) as its one of my faves and is such a small compact so handy for travelling. This is very similar to Prosecco Pop but more of an intense gold with more glitter running through it than a dewy glow. I'll be keeping my brows looking good with the new Maybelline Tattoo Brow (£12.99)* as it will give me that filled in brow look even when i'm not wearing makeup round the pool. For night time use the Freedom Brow Pomade (£5.00) as the creamy formula glides on well and stays in place even after a long day so I know it will work well in the heat. As it will be so hot I will be keeping my makeup simple and especially my eye makeup so there will be no lashes taken, although I have just had LVL lashes done and my real ones looks amazing. My eyeshadow will consist of lots of shimmery neutrals and so the Juvia's Place The Nubian Eyeshadow Palette (£30.00) has all of that featured. It's 12 warm toned shades in a matte or shimmer finish with amazing pigmentation. I will also be taking with me the Jouer Skinny Dip Palette (£35.00) as it has every foiled eyeshadow shade you would need, with golds, bronzes, silvers and a pink. As I just said I have had LVL lashes so I don't need lots of mascara to make them seem curled and long but I will still be taking some with me. The Maybelline Big Shot Mascara (£7.99) has a collagen infused formula that provides lots of volume from the base to the tip. The formula is quite wet so I tend to layer something like this over another mascara. The Tarte Lights, Camera, Lashes 4-in-1 Mascara (£21.00) really lengthens my lashes and the narrow brush helps coat all lashes and add lots of curl. One of the most important parts and especially with the heat will be setting my makeup in place and the Cover FX Illuminating Setting Spray (£22.00) fixes my makeup in place all day. The light mist settles onto skin and locks my makeup in place without adding too much moisture. This also has a slight shimmer to it so my skin really glows and it will look incredible with a tan. Lip products haven't been mentioned in todays post as I have a whole post about them here. Do you take any of these products away with you? I'm so desperate to try the Nubian Eyeshadow Palette, the shades just look so amazing!